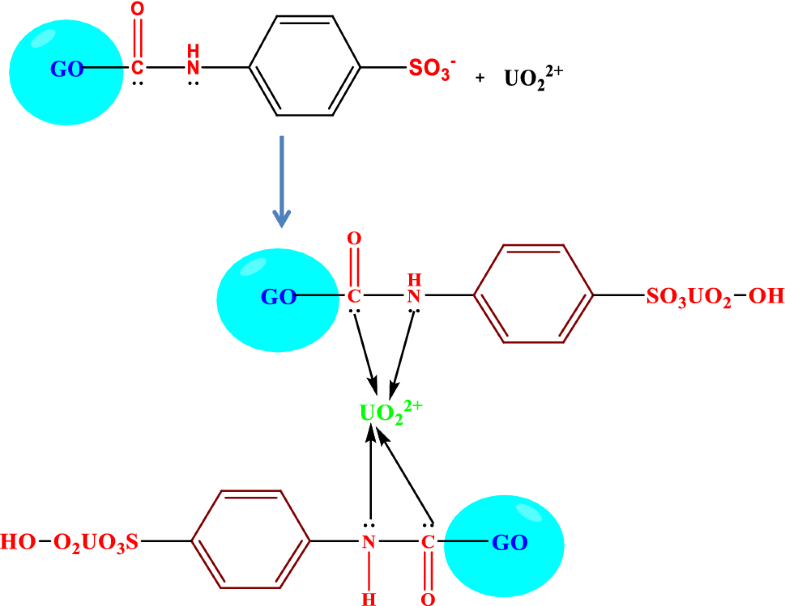 Graphene oxide functionalized 4-aminobenzenesulfonate (sulfanilic acid) (GOSN) has been synthesized by the reaction of sulfanilic acid with graphene oxide for U(VI) ions adsorption from aqueous solutions. The controlling factors that affect the adsorption process have been studied using batch technique. The obtained results demonstrated that the maximum uranium adsorption capacity by GOSN was 320.57 mg g−1, the obtained results were subjected to analysis by isotherm models, Langmuir and Freundlich models. The GOSN was characterized by FT-IR, BET isotherm studies, and SEM. 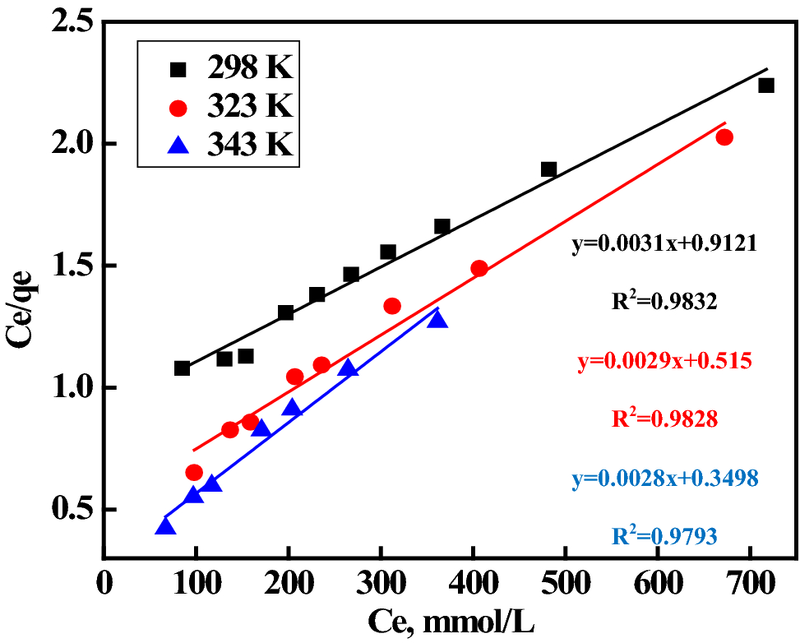 The Uranium adsorption process was best described by the Langmuir isotherm model with a maximum adsorption capacity of 320.57 mg g−1. It has been observed that the adsorption of uranium fitted better with the pseudo-second-order kinetics. The GOSN adsorbent exhibited greater adsorption capacity than graphene oxide for hexavalent uranium and has potential application for U(VI) removal from aqueous solution. Uranium is considered to be not only an irreplaceable raw material for nuclear energy, but also a serious long-term potential environmental hazard having both radiochemical and toxicological effects [1, 2]. It has biologically dynamic activity and chemical toxicity, leading to potential harm to mammalian reproduction systems in the form of reduced fertility . Over the past few decades, a variety of technologies including chemical and physical methods such as precipitation , solvent extraction , ion exchange , membrane processes , and adsorption [8, 9] have been developed for the removal and recovery of uranium from nuclear fuel effluents, mine tailings, seawater and other waste sources. Lately, adsorption, due to its high-efficiency and readily handling has been gradually utilized. Therefore, the design and preparation of adsorbents with low cost and high-stability, efficiency and selectivity has been drawing considerable interests in processing uranium recovery and decontamination . Therefore, new adsorbents with high adsorption capacity and mild adsorption conditions are still required for radionuclides treatment. The special and unique characteristics of the adsorption process such as simplicity of design, low cost, ease of operation and insensitivity to toxic pollutants and smaller amounts of harmful substances make adsorption process promising and effective results for the removal of radioactive metals from aqueous solution . Graphene oxide is one of the most promising nano materials which is two dimensional carbon based material have atomic thickness and undoubtedly. The unique excellent properties make graphen used in wide spectrum applications such as sensors; electronics to optics and environmental application.The oxidized form of graphene is the Graphene oxide which possess different functional group as carboxyl, epoxy groups and hydroxyl groups. The unique properties of graphene oxide (GO), such as strong reactive sites, high surface area, and abundant oxygen-containing functional groups, made it a superior adsorbent for the removal of a variety of radionuclides from aqueous solutions [12, 13, 14]. The high negative charge density of graphene oxide resulting of oxygen content of functional groups, As a result of the presence of ionizable carboxyl group on the GO make it act as weak Acid cation exchange resin, which permit exchange of positively charged molecules or metal cations. The graphene oxide functional groups can interact with positively charged species like metal ions, biomolecules, and polymers [15, 16]. GO has some advantages compared to other adsorbents due to its low cost and environmentally friendly nature. In addition, chemical modification of graphene and GO can increase its applications . The GO adsorption affinity to many metal ions is sturdy, and varies from the types of metal ions. The higher electronegativity of metal ions, the stronger attraction of the metal ions on the negatively charged GO surface. In addition, the complexation of heavy metal species with surface oxygenous functional groups (e.g. hydroxyl and carboxylic groups) was also one possible adsorption mode, and the speciation of heavy metal ion species was determined by the stability constants. The mechanisms for the adsorption of metal ions on the surface of GO were ascribed to electrostatic attraction , ion exchange  and surface complexation . In this work, a controllable way to modify surface properties of graphene oxide with sulfanilic acid was developed. The surface functionalities of graphene oxide sheets which can be accurately changed, as well as the uptake efficiency toward uranium were studied. We designed to prepare new adsorbents by combining graphene oxide and sulphanilic acid to get the synergistic effect for the adsorption of Uranium ions and increase the adsorption efficiency of the new adsorbent. Then use of the new adsorbent to increase the accuracy of Uranium isotopes activity concentrations measurement by applying a modification on the radiochemical procedure used for sample preparation and purification, and this modification is based on replacement of Dowex 1 × 4 by GOSN. The natural uranium isotopes abundances are 238U(99.27%), 235U(0.72%) and 234U(0.057%) which comprise the natural isotopes and have the same geochemical behavior. The α-emission of the three natural isotopes is as flow; (1) 238U decay by α-emission into 234Th which decays by ß-emission into protactinium (234Pa). 234Pa decays by ß-emission into 234U, (2) 234U decays by α-emission into thorium (230Th) and (3) 235U decays by a-emission into thorium (231Th) which is then decayed by ß-emission into protactinium (231Pa). The concentration and the isotopic ratios of uranium are always determined and detected in different types of samples (geological, biological and environmental samples) by different techniques (destructive and nondestructive). Hence, α-spectrometry could be considered as a non destructive technique for uranium isotopes with low detection limit levels below ng L−1. The detection limit found to be 100–1000 times lower than γ—spectrometry [21, 22]. Also, α-spectrometry used for the detection and uranium analysis and also thorium isotopes, especially environmental and water samples which characterized by low level radiation . A useful technique that used for geological studies, characterization of nuclear wastes like the uranium isotopes detection (238U, 235U and 234U) and trans isotopes of uranium (239+240Pu, 244Cm) in liquid wastes containing radioactive ions (sludges, evaporation residues) of small and medium activity VVER-440 reactor of the nuclear power plant in Paks Paks [24, 25, 26, 27]. Also, -spectrometry is considered as a cooperative tool for the analysis of uranium isotopes in waste waters released into the environment [28, 29, 30, 31, 32]. The procedures of alpha spectrometry were occurred through a few stages including preparation of samples, radiochemical separation, preparation of source and α -counting [33, 34, 35, 36]. sample digestion carried out using a microwave. This step decreases the acids usage and other reagents, emission of hazardous, and the produced waste through the uranium sample preparation in soils and analysis by alpha spectroscopy . Source preparation on a stainless steel disc which is achieved by direct evaporation or electro deposition. 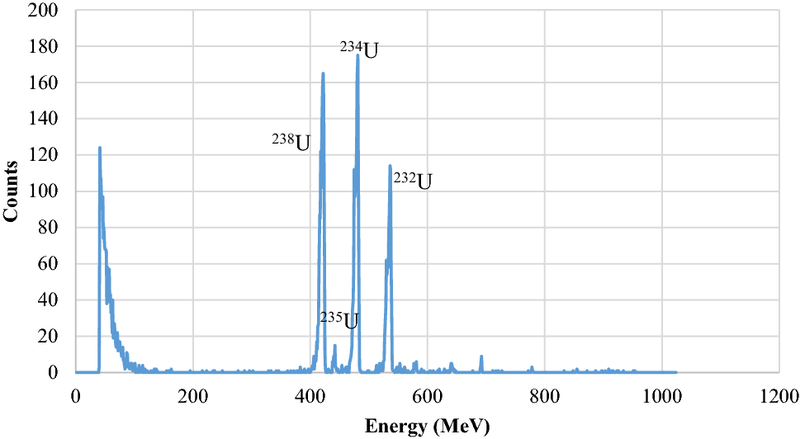 The fundamental aim of this research is to increase the accuracy of Uranium isotopes activity concentrations measurement by applying a modification on the radiochemical procedure used for sample preparation and purification . This modification is based on replacement of Dowex 1 × 4 by GOSN. 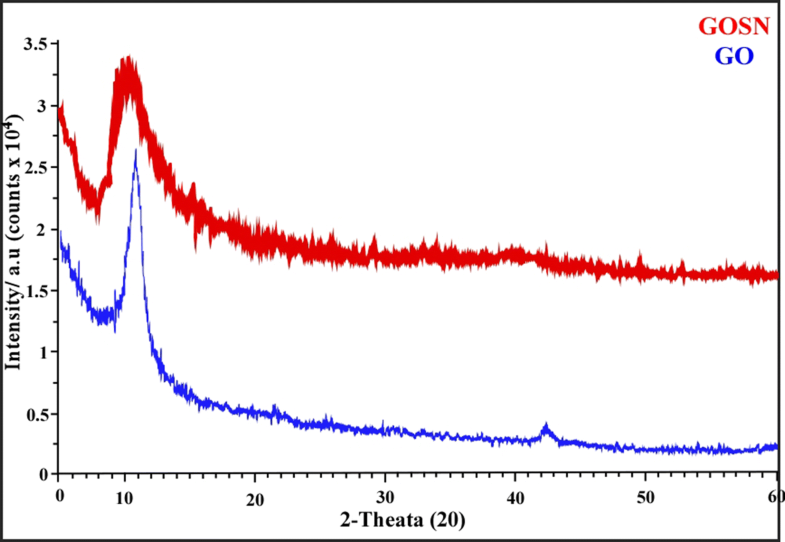 A stock solution of 1000 mg L−1 U(VI) was prepared using UO2(NO3)2.6H2O which was obtained from Merck Co. Concentrated HNO3 acid was added to the stock solution of U(VI) for the inhibition of U(VI) hydrolysis. Sulfanilic acid was also obtained from Merck. All other chemicals were of analytical grade and used without further purification. All testing solutions were prepared with de-ionized water. 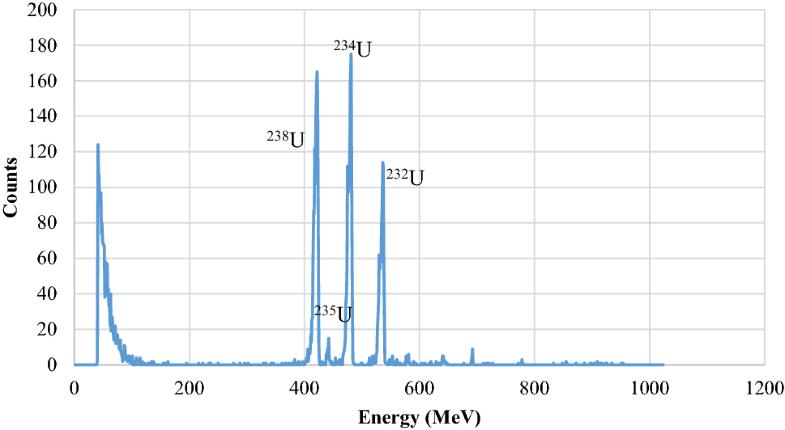 Spectrophotometric determination of uranium and the FT-IR spectra of the adsorbent were recorded using the Jasco model V 650 and 4200 instruments respectively. An Li 127 (Elico, India) model pH meter was used for pH measurements. The SEM images and the EDAX spectra were obtained using a JEOL JSM-6390 analyzer. GO was synthesized using modified hummers method as In brief; A mixture of 3 g NaNO3 and 70 ml of concentrated H2SO4 was added to 1 g graphite powder in an ice bath. Then 3 g KMnO4 was gradually added for 15 min under stirring. The stirring continued for more 2 h at ambient temperature. Then deionized water was added for dilution and stirring continued for more 30 min. Thereafter, 5% H2O2 was added to the mixture until the yellow colure of the mixture appear which indicating the full oxidation of the graphite . The graphite oxide was then dispersed in DI water and the graphite oxide was then exfoliated to produce graphene oxide nanosheets by ultrasonic bath. The mixture was then, filtered and washed with dilute solution of HCl (1:1) to remove metal ions. Finally the excess acid was removed by washing the product with de-ionized water. The GO carboxylic groups were activated by chlorination to attach chlorine to their surface. The procedures of chlorination were as flow: 20 ml of thionly chloride (SOCl2) was added to 200 mg of GO. The Mixture was then sonicated for 30 min. in an ultrasonic bath. The mixture was then refluxed for 36 h at 80 °C. The mixture was then cooling at room temperature, then filtered through centrifugation (10-µm pore size) (model HERMLE Z336 K, Germany) and washed with ethanol and tetrahydrofuran. Finally the produced material was dried for 4 h in the oven at 70 °C. Firstly, GO was reacted with thionyl chloride (SOCl2) in order to convert the hydroxy functional groups to chlorine (Scheme 1). This produced chlorine functionalized graphene (CFG) was synthesized. This material is useful for further functionalization. The CFG material was previously synthesized and characterized . CFG contains C–Cl bonds in forms of alkyl and acyl chlorides, which can be subjected to substitution reactions using diverse nucleophiles. Using thionyl chloride, the carboxyl groups could be converted to acyl chloride and hydroxy groups to chlorine functionalities. Also, oxirane rings are converted to b-chlorohydrins in the presence of thionyl chloride (SOCl2). In addition, the remaining oxirane ring on the graphene surface can undergo a ring opening reaction with nucleophiles. The proposed reaction mechanism shows thionyl chloride interacting in a nucleophilic mechanism with a carboxylic acid. In the presence of SOCl2, carbonyl oxygen can form intermediate of a sulfite ester (good leaving group) that can interact with nucleophiles. Through the acyl chloride formation, the displaced sulfite ion is unstable and decomposes into SO2 and Cl−. The edges and basal planes of the graphene oxide are functionalized with hydroxyl and carboxylic which explain how thionyl chloride modification takes place . 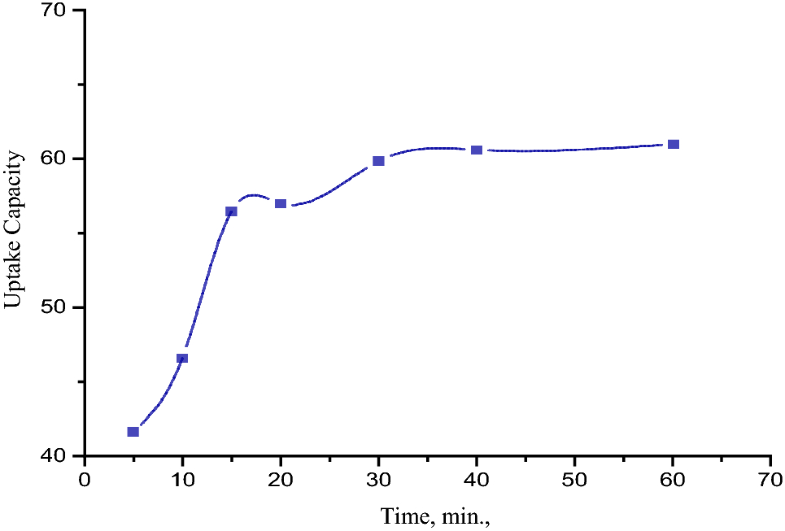 The chlorinated grapheme oxide (CGO) was dispersed by sonication in 30 mL of dimethylformamide (DMF) for 45 min. then adding 600 mg of sulfanilic acid. The solution was refluxed for 40 h at 80 °C. The resultant suspension was separated by centrifugation, washed with ethanol three times, and then with tetrahydrofuran (THF). The black solid, with new amide groups attached to the Graphene oxide (Scheme 2), was then dried at room temperature under vacuum. The adsorption procedures was occurred under the pH controlled and was carried out by adding 0.1 g GOSN in different flasks, each one of them contain 20 ml solution of U(VI) ions with concentration 250 ppm. The solution pH was adapted in the range 1–6 using 0.01 M sodium hydroxide or 0.01 M hydrochloric acid solutions. The flasks were shake well using water bath model 1083 (Labortechnik GmbH, Germany) for 2 h at 300 rpm at and 25 °C. When equilibrium achieved, the determined of residual concentration of the metal ion was occurred. The FT-IR spectra for the GO sheets, and GOSN are shown in Fig. 1. The GO spectrum shows a broad and intense peak centered at 3385 cm−1 and a peak at 1732 cm−1 and are related to the OH groups and the carbonyl (C=O) stretching, respectively. The peaks at 1339, 1223 and 1057 cm−1 are assigned to the OH deformation of the carboxyl (C–OH) and epoxide (C–O–C) groups, respectively. The peak at 1601 cm−1 is associated with the remaining sp2 character of graphite [42, 43]. 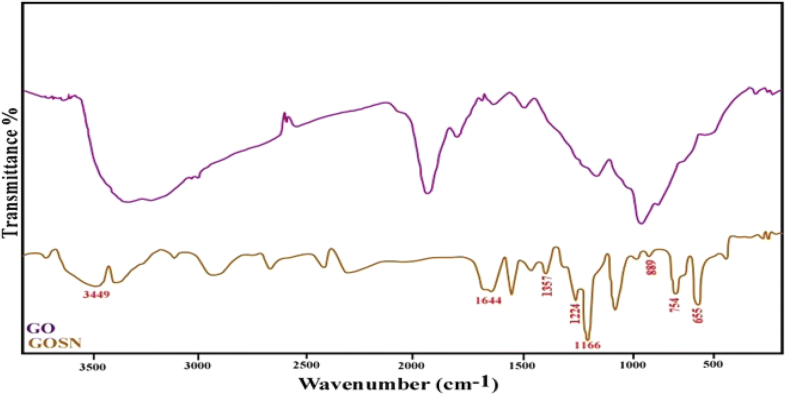 The IR spectrum of the sulfanilic acid-functionalized GO show a significance appearance of amide carbonyl (C=O) stretch at (1658 cm−1) with the disappearance of the graphene oxide carbonyl group . New bands appears at 3449 and 1223 cm−1 corresponding to N–H and C–N bonds strectching, respectively which confirms that the amide functional group is presence, the band at 3090 cm−1 CH stretching of an aromatic ring. The symmetric and asymmetric bands of SO2 are appears at 1166 and 1357 cm−1 . Also the bands at 655 and 754 cm−1 are characteristic bands of aromatic CH out–out of plane bending vibrations. The weak band at 889 cm−1 may be assigned to CH out-of plane bending vibration for one isolated hydrogen in the penta substituted benzene ring . These results indicate that the GO has successfully modified by sulfanilic acid (Fig. 1). GO demonstrated a two-dimensional multilayered structure with lateral sizes of several nanometers, as the reported literature while in the GOSN, the combination between GO and sulphanilic acid caused disorderness in the basal plane (Fig. 2). The XRD spectrum was used to characterize the GO and GOSN crystalline nature (Fig. 3) the strong diffraction peak of GO is appears at 2ϴ = 10.7° that correspond to the (001) diffraction with an interlayer distance of approximately 0.83 nm. While the diffraction peak of GOSN move to lower 2ϴ angle with an interlayer distance 1.03 nm which is larger than GO by 0.2 nm. This increase in the layer to layer distance signifies the interaction of ANS with the GO surface and many of layers are separated. The adsorption process of uranium ions from aqueous solution is depending mainly on the solution pH that effect on the charge of the adsorbent surface, ionization degree and adsorbate speciation. 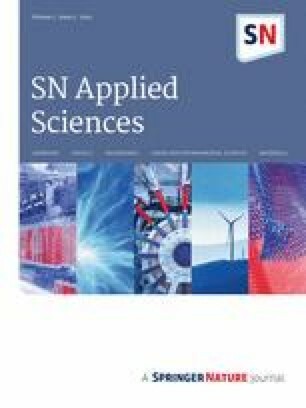 The researches concerning sorption of heavy metal indicating that the decrease of sorption at acidic media might be because of the expansion in rivalry with protons for active sites. At the alkaline pH values, however, other effects may arise from a few procedures, for example, surface charge changes, appropriate salt precipitation, presence of predominant hydrated species of heavy metals [47, 48]. 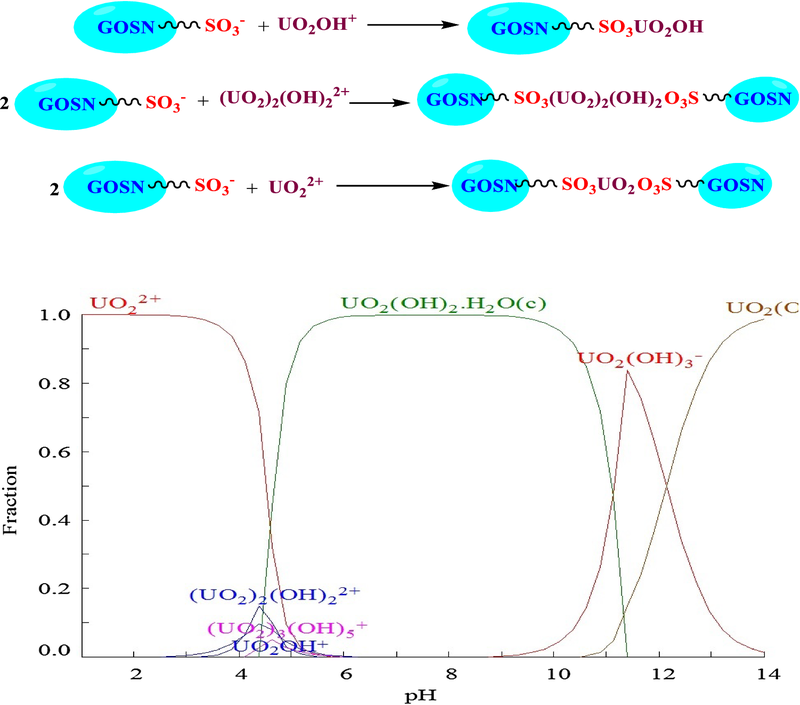 To verify the pH effect on U(VI) ions adsorption onto GOSN, experiments were conducted modifying the initial solutions pH from 1 to 5. The obtained results are shown in Fig. 4. The results show that the pH value is very significant for the performance of GOSN in the adsorption of U(VI) ions from the solution. The adsorption capacity of the GOSN increases sharply at pH range 2–3.5, and at pH>3.5 the adsorption capacity decreases. The optimum initial pH of the U(VI) ion solution in the process of U(VI) ions adsorption onto GOSN is 3.5, where almost 90% of uranium is removed. The further experiments were conducted at an initial pH of the solutions of 3.5. As shown in Fig. 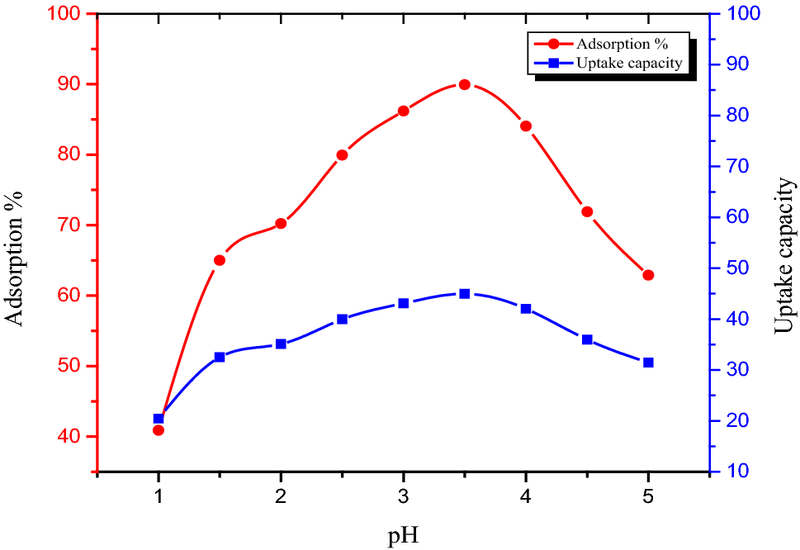 4, further increases in solution pH higher than 3.5 showed a clear decrease in uranium adsorption efficiency which was due to the disappearance of uranium cation species shown in Fig. 5. According to the experiment of initial pH 3.5, the following adsorption scheme is more appropriate to be considered and the possible coordination mechanism for the interaction between uranium cations and GOSN may be as follows, Fig. 6. The GOSN dosage is an important parameter to obtain the maximum uptake capacity of U(VI) ions. 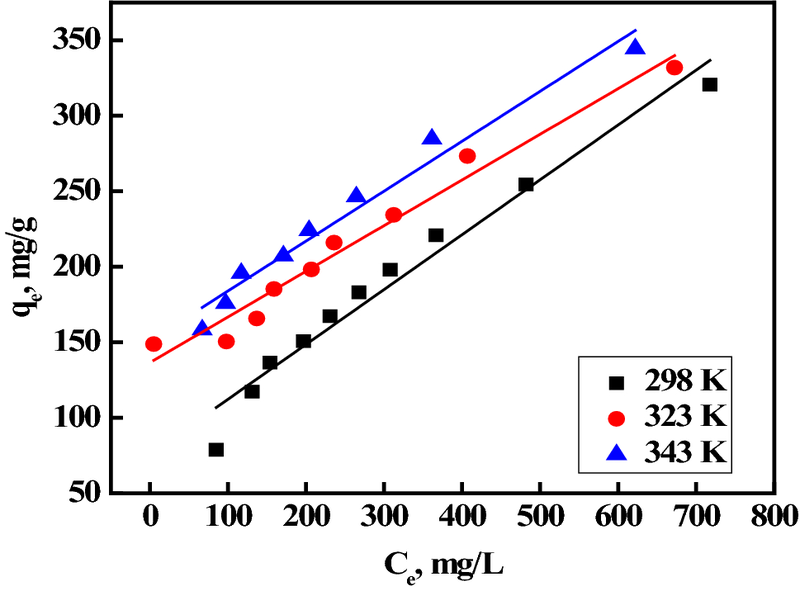 Figure 7 shows the relation between adsorption capacity against different GOSN dosages. It was observed that the adsorption capacity increases rapidly with increasing GOSN dosage from 0.01 g until reaching the equilibrium at 0.1 g. It can be also noticed that the adsorption capacity decreases with increasing GOSN dosage because saturation by 0.1 g GOSN active sites takes place by all U(VI) ions and after 0.1 g the number of GOSN active sites become higher than U(VI) ions in the solution. due to the occurrence of equilibrium condition as the number of metal ions attached to the surface of adsorbent and the number of mobile ions remained constant. Therefore, further addition of adsorbent could not change the adsorption significantly, Hence, the adsorption capacity of GOSN decreases by increasing the dosage after 0.1 g. Therefore, 0.1 g was selected as an optimized parameter for further experimental studies . 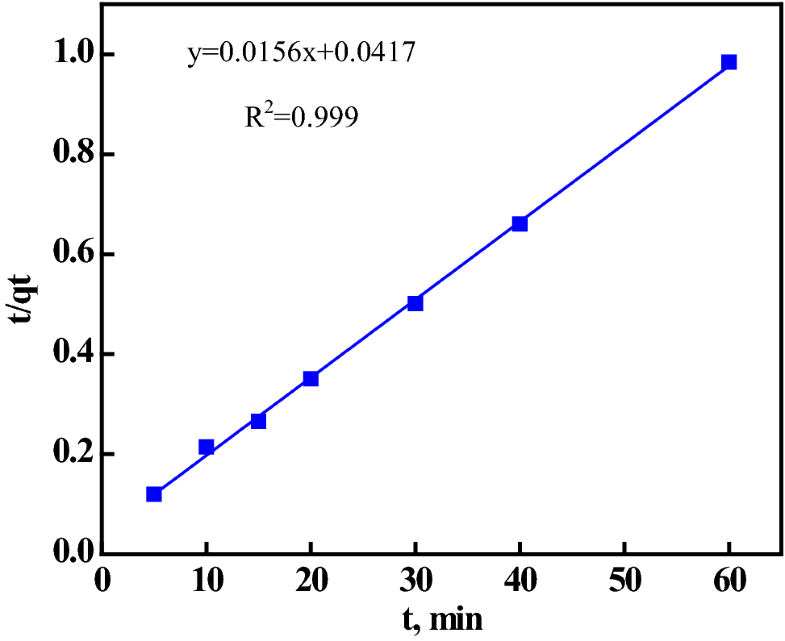 The effect of shaking time on the adsorption of U(VI) studied from 5 to 60 min is plotted in Fig. 7. 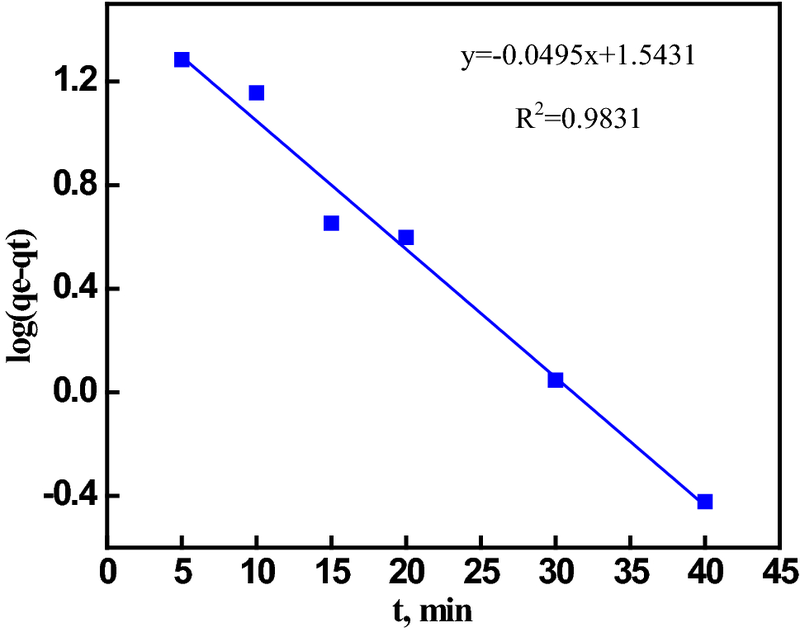 The adsorption efficiency increase gradually with increasing time reaching the equilibrium at 20 min. and being constant thereafter. From Fig. 8, it can be seen that the U(VI) uptake capacity increases sharply within the first 20 min, then remained steady with further increase in contact time, reaching a final removal of > 98%. The adsorption process began with an initial fast sorption step occurring on the external surface, followed by a slow second diffusion step while the solute reached the inner sphere pores. The short equilibrium time indicates high efficiency and economic feasibility of the sorbent for industrial applications. where qe and qt are the amounts of U(VI) adsorbed (mg g−1) at equilibrium and at time t (min), respectively. k1 (min−1) and k2 (g mg−1 min−1) are the rate constants of pseudo-first order and pseudo-second-order rate constants, respectively. Kinetic parameters are calculated and shown in Table 1 and (Figs. 9, 10). The results clearly indicate that the rate of adsorption of U(VI) onto GOSN depends on the initial concentration of U(VI). The applicability of these models was quantified from the coefficient of determination, R2 (Correlation coefficient values). The values of R2 show that the pseudo-second-order can describe the experimental data better than the pseudo first-order model. Moreover, the theoretical qe values calculated from the pseudo second-order model are close to the experimental data. These results confirm the validity of the pseudo second-order model to the adsorption system, suggesting the main adsorption mechanism is chemical adsorption. 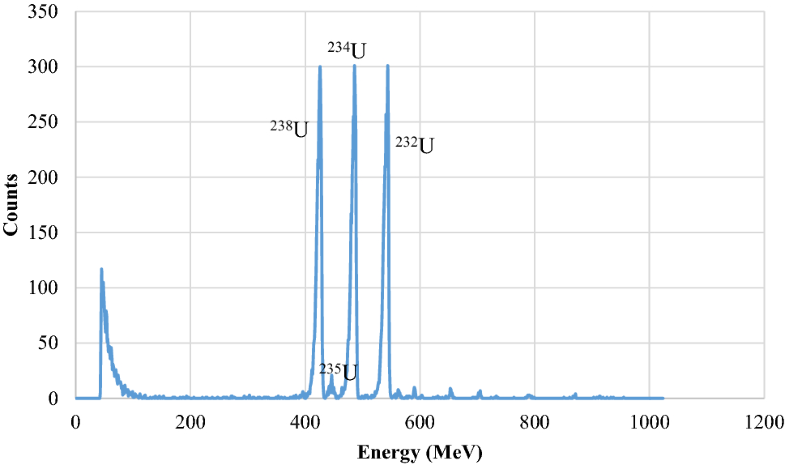 The effect of initial U(VI) ions concentration was examined utilizing a range of initial U(VI) ions concentrations between 50 and 1100 mg L−1 at three fixed temperatures (25, 50 and 70 °C). As shown in Fig. 11, the U(VI) uptake capacity increases with increasing the initial U(VI) concentration. This may be due to higher U(VI) ions concentration which enhance the driving force to overcome mass transfer resistance between the aqueous and GOSN. Further, it is observed that the increase of the U(VI) ions adsorption by GOSN with the temperature increasing which indicating the endothermic nature of the adsorption process. where Qmax (mg g−1) represents the maximum amount of U(VI) ions per unit weight of GOSN to form a complete monolayer, b, is the Langmuir sorption coefficient that represents enthalpy of adsorption, qe is the amount of U(VI) ions adsorbed by GOSN at equilibrium, and Ce is the equilibrium concentration of U(VI) ions. where 1/n is an indicator of isotherm nonlinearity corresponding to the adsorption intensity at a particular temperature and k (mg1−n Ln g−1) is the Freundlich adsorption coefficient related to the adsorption capacity of GOSN. 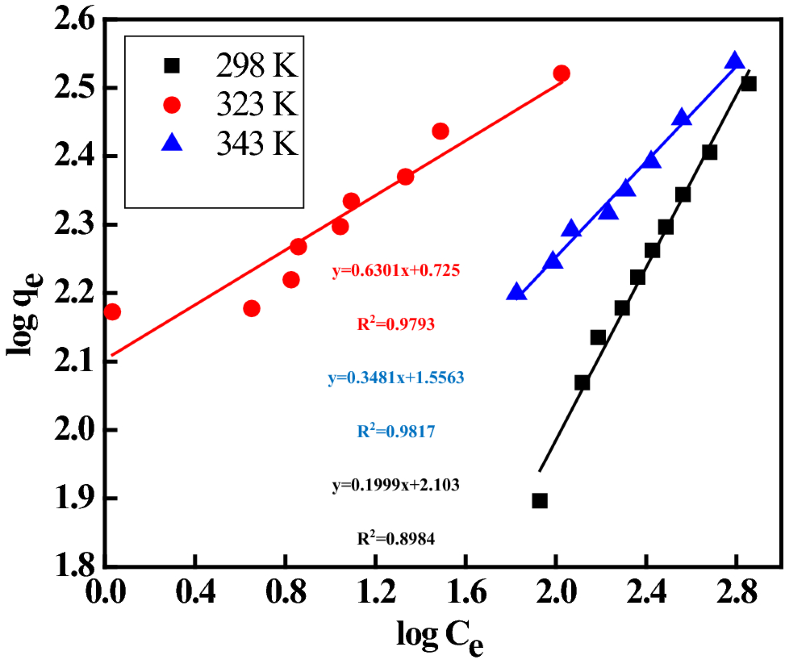 The Langmuir and Freundlich constants evaluated from isotherms and their correlation coefficients of U(VI) ions adsorption by GOSN are presented in Table 2. The Freundlich plot has a very low correlation coefficient, this may be a restriction on the use of Freundlich isotherms. The numerical value of 1/n < 1, which provides information about surface heterogeneity and surface affinity for the solute, indicates a very high affinity of the GOSN for U(VI) ions. where Co is the initial U(VI) ions concentration (mg L−1) and KL is the Langmuir adsorption constant (L mg−1). The suitability degree of the adsorbent towards U(VI) was evaluated from the separation factor constant (RL) values, (Eq. 5), which gave an indication for adsorption process possibility to be proceeded as follow: RL = 1 linear; RL > 1 unsuitable; RL = 0 irreversible; 0 < RL < 1 suitable;. 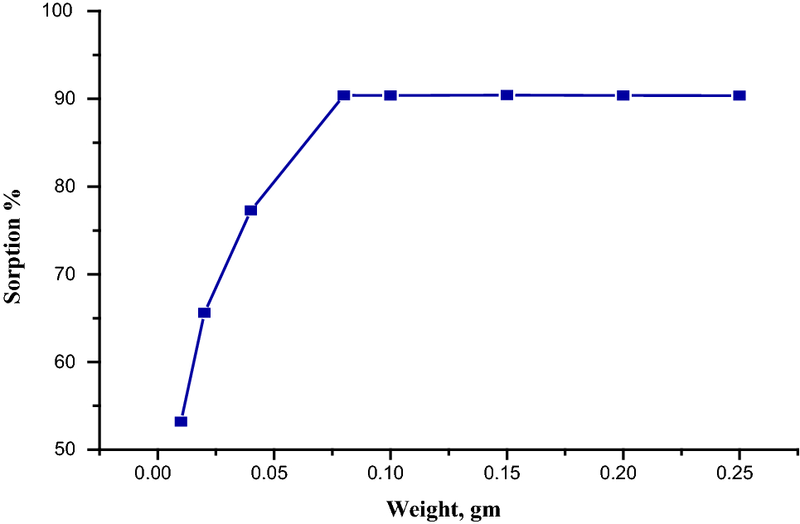 It was found that the values of RL lies between 0.727 and 0.0425 which indicate the suitability of GOSN for U(VI) ions adsorption from aqueous solution. Also, the observed increase in KL values with temperature indicates that the adsorption reaction is endothermic in nature. This can be confirmed by the calculation of the thermodynamic parameters. The calculation of thermodynamic parameters (ΔH°, ΔS° and ΔG°) was occurred from Eqs. (6 and 7) and their values were tabulated in Table 3. The data obtained show that the value of ΔG° increased with increasing temp. This gives an indication that the adsorption process becomes more favorable at higher temperature. 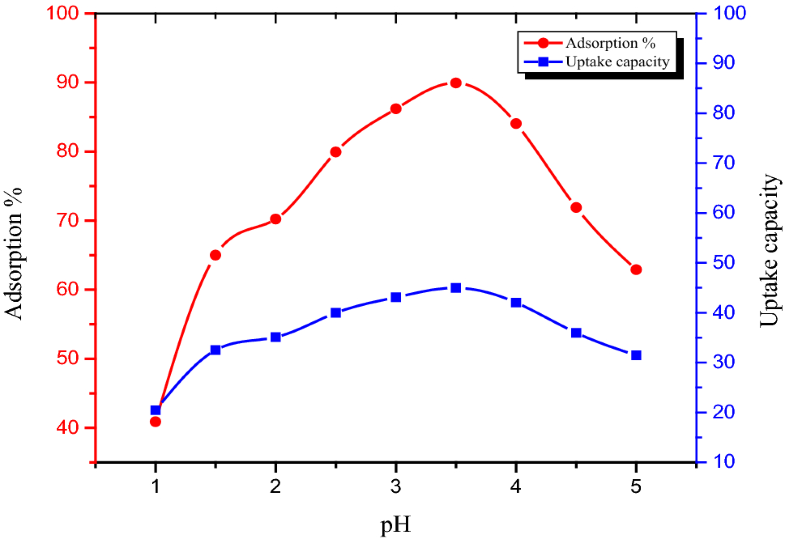 The value of ΔH° is positive which indicated that the adsorption process is endothermic. While the value of ΔS° is positive this explained with the increasing of randomness degree. The positive value of ΔH° for U(VI) ions adsorption indicates that adsorption by GOSN is an endothermic. This may be due to the hydration sheath denuded to some extent, and this dehydration process needs energy. The positive ΔS°value indicates that the adsorption is spontaneous with high affinity. The negative ΔG° values indicate a spontaneous process under the conditions applied. The decrease of ΔG° with increasing temperature indicates more efficient adsorption at higher temperatures. The thermodynamic parameters reflect the affinity of GOSN toward U(VI) ions [55, 56]. The desorption experiments were carried out by rinsing the GOSN loaded U(VI) ions with a series of concentrations (0.01, 0.1, 0.5, 0.75, 1.0, 2.0 M) of HCl and H2SO4 for 5 h under continuous stirring Fig. 14. The GOSN was separated by centrifugation and the concentrations of U(VI) in solutions determined with UV–Vis spectrophotometer using Arsenazo III as reagent. 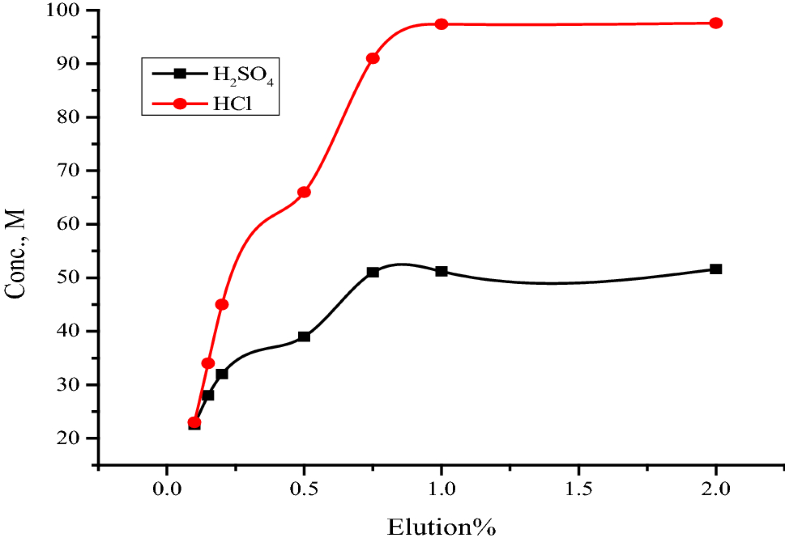 The experimental results show that 1.0 M HCl is the best eluent giving the best elution efficiency, indicating that GOSN has a good desorption property (99.1%) for U(VI) ions using 1.0 M HCl solution. This procedure was applied in some rock samples collected from Gattar area (GII) uranium prospect which located in 35 km southwest of Hurghada city, Red Sea coast. The aim of this study is to use this new procedure for separation and determine of uranium and its isotopes (238U, 234U and 235U). The procedure of uranium measurement using alpha spectrometric includes several steps such as sample pretreatment, thin alpha source preparation by electrodeposition or micro-coprecipitation, radiochemical separation, and high-resolution α- counting. For the alpha determination, the rock samples preparation include grinding of the sample to smaller than 200 mesh and mixed well. A known weight of subsamples (1 g) were weighted into pre-cleaned OMNI vessels and digested with Microwave Accelerator reaction system MARS 5. In 20 ml aqua regia (15 ml HCl + 5 ml of HNO3). The vessels were locked and the dissolution program of the Microwave was used with pressures of 19 and 55, power of 1600 W bar; stage (1), 0 to 20 min at 165 °C; and stage (2), 20 to 35 min., hold for 10 min. at 195 °C. After cooling, the digest was passed through 0.45 µm polypropylene filters. The produced digests were kept in Nalgene at 4 °C until analysis . The samples with all content including interfering elements were then transferred to 9 M HCl in a column that used for resin activation. The uranium elution was occurred by adding 10 ml of 0.1 M HCl to the column after that the eluted uranium was evaporated to dryness. The dried sample was dissolved in 5 mL of 1 M HCl, The carrier was then also added 0.3 mL of Ce (100 µ m−1), The carrier was then also add, then the reduction of U(VI) to U(IV) was occurred by adding few drops of TiCl3, and 0.5 mL of HF was finally added. The 232U tracer is added for chemical yield and activity calculation. Therefore, the determined amount of the 232U tracer added is according to the expected uranium concentration in the samples. The experimental condition is depending on the chosen of source preparation technique and data requirements. The Sources chosen and prepared for measure alpha particle energies or calibration purposes and study alpha particle fine structure, must have the highest possible resolution. The obtained results in terms 238U, 234U and 235U of isotopic activity concentrations (Bq g−1) are shown in Table 4. From the granite rock samples listed in Table 4 from SQ-1 to SQ-12, the concentration of 238U were ranged between 30 ± 1 Bq g−1 for SQ-6 and 137 ± 2 Bq g−1 for SQ-11. The 234U concentrations were between 27 ± 1 Bq g−1 for SQ-6 and 145 ± 2 Bq g−1 for SQ-2. For the 235U, the activity concentrations were between 1 ± 0.1 Bq g−1 for SQ-6 and 6 ± 1 Bq g−1 for SQ-2 and SQ-11. The spectrums for uranium isotopic activity concentrations were shown in Figs. 15 and 16. Graphene oxide functionalized sulfanilic acid (GOSN) was successfully prepared and investigated. The adsorption properties of U(VI) ions by GOSN is dependent on the solution pH and initial uranium conc. The adsorption process of U(IV) ions is fitted to the Langmuir adsorption isotherm model and the pseudo-second order kinetic model. In comparison with the GO nanosheets, the GOSN showed a better adsorption capacity onto U(VI) ions as the monolayer adsorption capacity was as high as 320.57 mg g−1, which was larger than that of GO nanosheets. Thermodynamic parameters demonstrate the adsorption of U(VI) ions by the GOSN were spontaneous and endothermic nature of the process. The results indicate that the GOSN is a potentially useful adsorbent for removal uranium ions from aqueous solution with higher efficiency. Successfully replacement of Dowex 1 × 4 in the old method by GOSN with high accuracy in compared with the old method.